Metlox "Lotus". The "Lotus" pattern was made from 1979-1986. 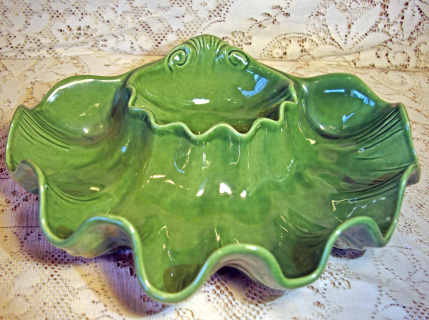 Classic 1980's Metlox "Evergreen Lotus" Chip & Dip Serving Tray. Stunning green serving tray measures 13" long, 11" wide & is 3" deep. Excellent Condition; never used, no damage. Beautiful shiny glaze.